This paper analyzes the extent of income inequality from a global perspective, its drivers, and what to do about it. 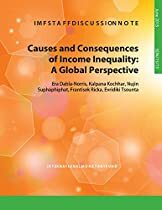 The drivers of inequality vary widely amongst countries, with some common drivers being the skill premium associated with technical change and globalization, weakening protection for labor, and lack of financial inclusion in developing countries.We find that increasing the income share of the poor and the middle class actually increases growth while a rising income share of the top 20 percent results in lower growth—that is, when the rich get richer, benefits do not trickle down. This suggests that policies need to be country specific but should focus on raising the income share of the poor, and ensuring there is no hollowing out of the middle class. To tackle inequality, financial inclusion is imperative in emerging and developing countries while in advanced economies, policies should focus on raising human capital and skills and making tax systems more progressive.